It’s not often that you find a cheap meal that is simple to make and results in a posh-nosh filled plate. 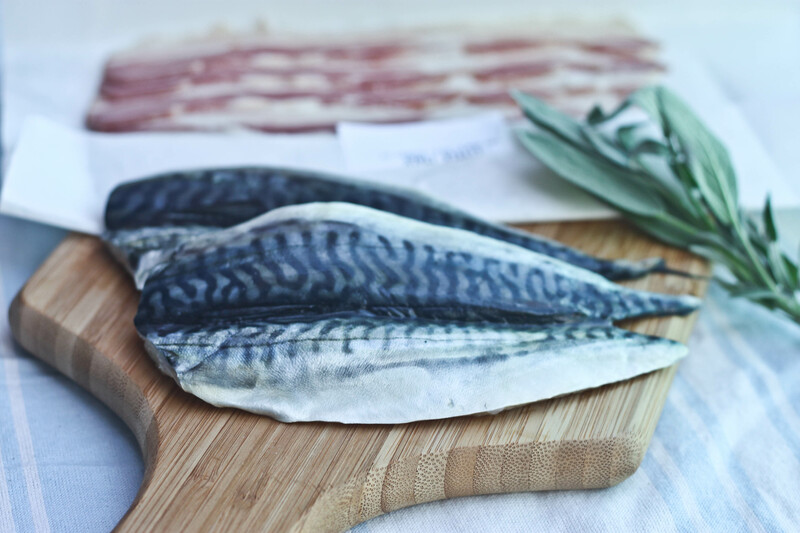 My lovely friend Anna mentioned the combination of mackerel, bacon and sage when she was visiting us from the UK last week. I found this recipe and used it as a template for my frugal feast this evening. I got some lovely smoked pancetta in Little Italy in Smithfield, at just €1.14 for six lovely slices and I got one mackerel, cut into four fillets, in Kish Fish for €1.71. I added two medium spuds and a handful of salad leaves, which meant dinner for two cost under a fiver. Eat your heart out, Ainsley Harriot! I love it when autumn rolls in and the focus turns to butternut squashes (squashi?). Perhaps the loveliest of all squashland, these sweet yet subtle beauties can be made into a bevvy of tasty suppers. 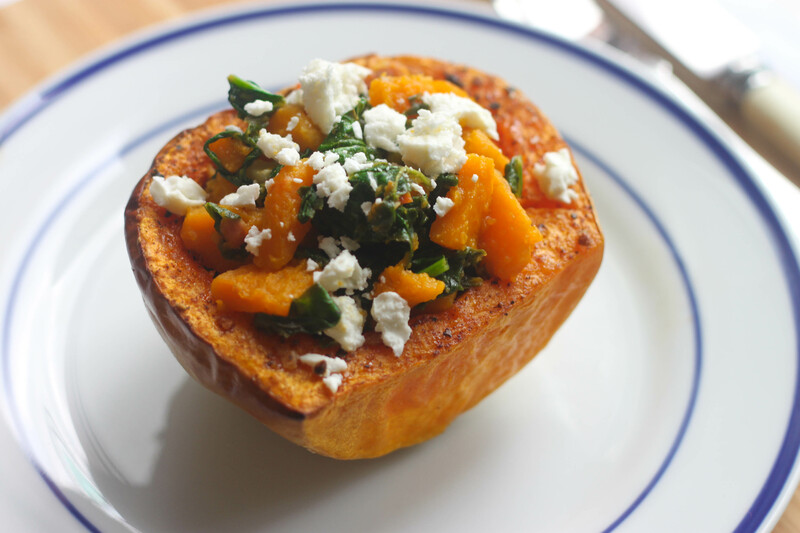 I found this recipe for a spicy stuffed butternut squash the other day on Delicious Magazine’s rather lovely website. I liked it so much that I made it twice. The first time, I stuck to the recipe as it was. The second time, I wanted to see how I could improve on it. So, I added some nutmeg and bacon, as well as using feta cheese instead of goat’s cheese. In the end, the nutmeg was a step too far. Or perhaps it was just too much to have the nutmeg and the bacon. Although the bacon was a wonderful addition, the original recipe didn’t really need it. 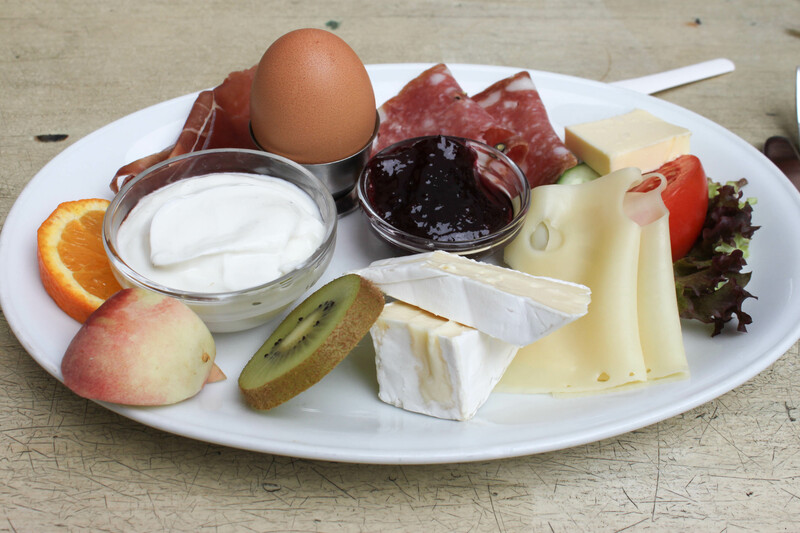 The feta cheese, however, worked as equally well as the goat’s cheese. 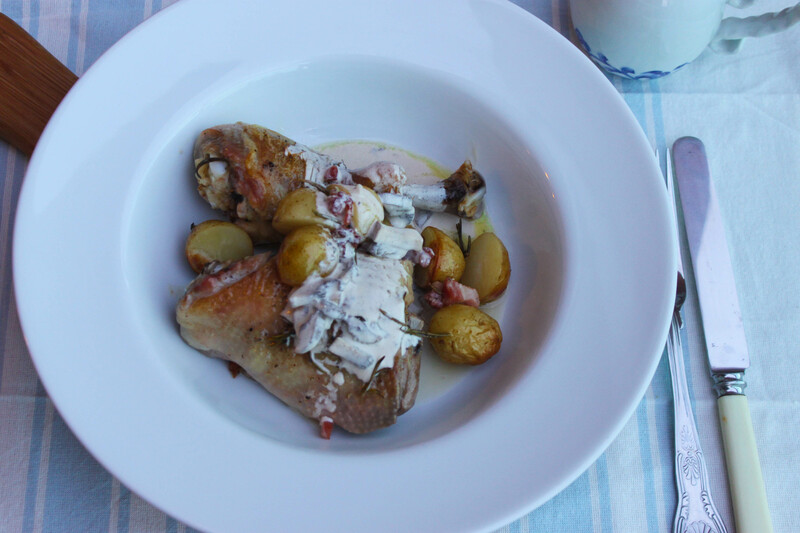 My lovely friend Anna is visiting us for the week and she shared this amazing AH-MAZING recipe that she makes with her fella (also our brilliant friend) Ben a lot in their home of Stroud, Gloucestershire, England. They got the idea for this incredible pasta sauce from a list of Nigel Slater’s most popular dishes of the last ten years for the Observer Food Monthly. 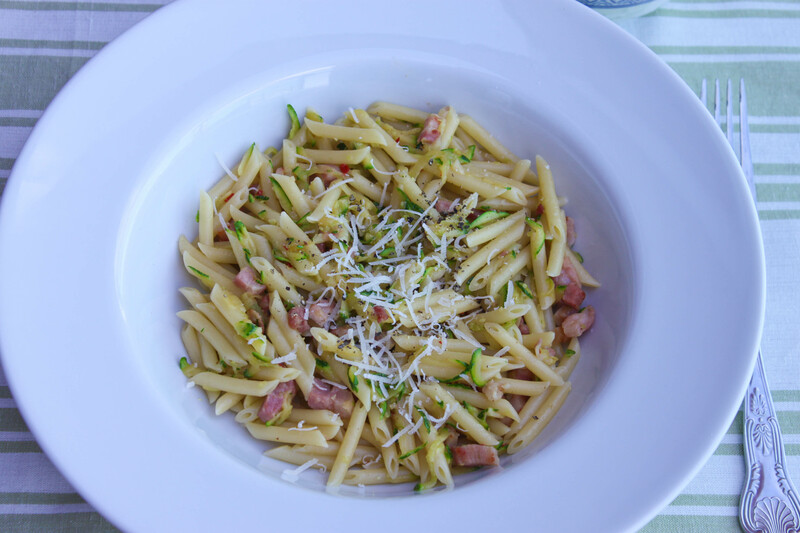 It’s designed as a side dish but Ben and Anna discovered it works exceedingly well stirred through some pasta. Having tried it today, I would most certainly concur. 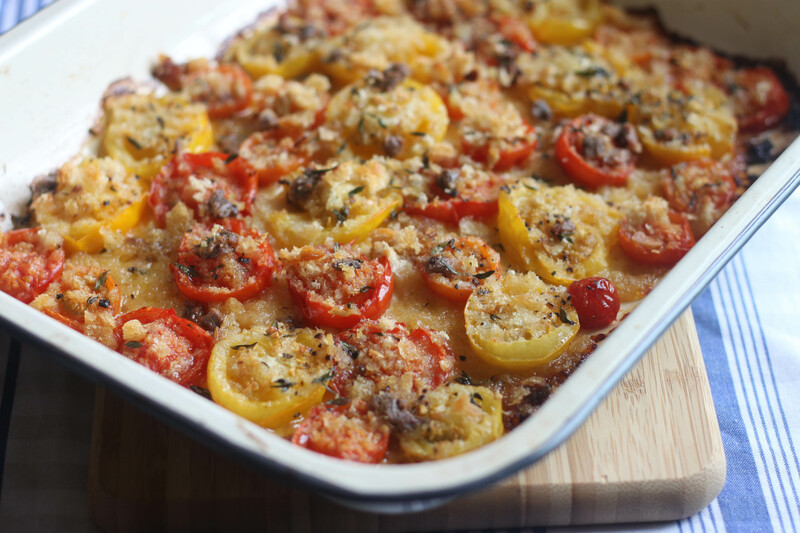 Apart from this recipe, some other things Anna brought over to us from Stroud were her homegrown yellow tomatoes – which we used in the dish – as well as the words yumbo scrumbo and cooly-wow. Both of which you should expect to see a lot more on this blog in the future. Yeow! The winds are changing and the mornings are getting nippy. It’s about that time that we start whipping out the comforting bakes. One of the best things about the move into autumn and winter is the food you get to eat. Porridge in the morning, soups in the afternoon and lovely comforting stews and bakes and pies in the evenings. This recipe for a one-pot lemon and chicken dish from Delicious Magazine caught my eye last week. I adapted it a bit to bulk up the flavours and I added a creamy mushroom sauce, to use up everything in my fridge before I went to Berlin. The result was a keeper and I know I’ll be making this or a version of it in the coming months. Here is another laughably simple pasta dish to put together, for those times when you’re too wrecked to spend more than 15 minutes in the kitchen. This is a little pasta dish I whip up on many a mid-week evening, originally inspired by this lovely Jamie Oliver recipe. My version takes about 8 minutes to make, depending on the type of pasta you choose. It uses courgettes as a kind of sauce, as they release a lot of moisture when they’re cooked. Now, it’s not a wet pasta dish by any means, so if you feel it’s a little dry for your taste, add a dollop of crème fraiche at the end of the cooking process to make it a bit more saucy. Courgettes are of course available year round but they are at their best in the summer months. Give this dish a go in the next week or two to squeeze the last of the loveliness out of those sleek and slender squashes. Tuesdays can really be a chore. Few more so than the Tuesday after The Electric Picnic. I was very sensible this year and rented a cottage about 8 miles away from the festival site. Coming home to a warm cottage with duvets and tea and slippers and an actual shower and a fridge was a joy each night. What’s worrying is that, even with all those creature comforts, I still managed to arrive home in a bit of a heap yesterday afternoon. Nothing a bit of sleep and a Pasta Tuesday couldn’t sort out however. 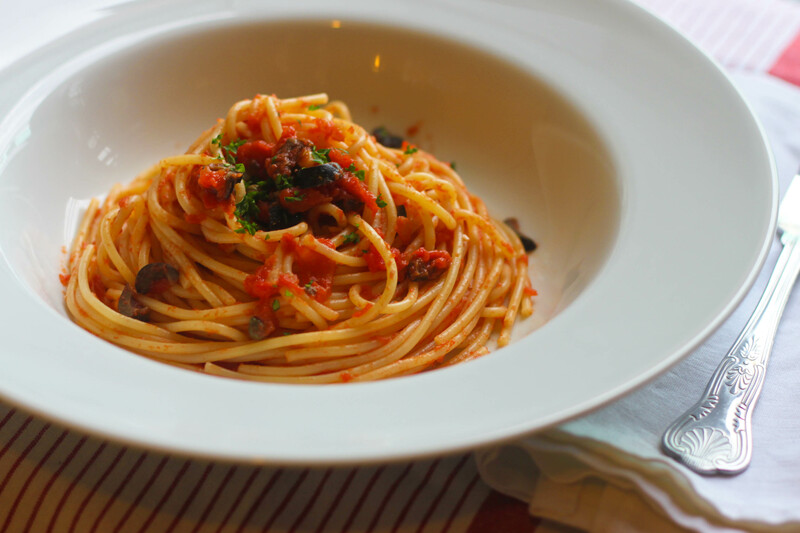 Another brilliant pasta dish for a Tuesday evening is the classic Spaghetti alla Puttanesca. 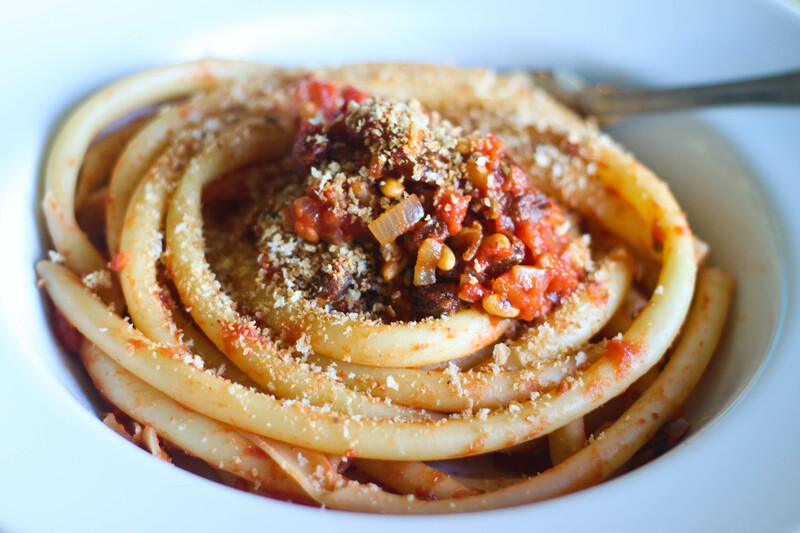 It was Kristin from Dinner du Jour who first brought my attention to the fact that Spaghetti alla Puttanesca roughly translates as Whore’s Style Spaghetti. Charming. It seems the dish wasn’t given its name because it was an instant favourite of ladies of the night when it first appeared in the south of Italy in the 1960s. Instead, the name seems to be more of a statement on the kind of lazy-arse person who would whip up such a simple yet delicious dish without even having to go the market for ingredients. A store-cupboard dish perfect for Pasta Tuesdays. Baking will most probably be forever shrouded in a mystical cloak of reverence for me. As I’ve gotten more confident with cooking, however, I find myself less amazed when something actually works for me. Don’t get me wrong. I’m still thoroughly and completely pleased with my achievements. But the same wide-eyed wonderment that I haven’t had a kitchen disaster has, thankfully, been cooked out of me. In saying that, what still really fills me with glee is when I find a recipe that is so stupendously simple to put together, yet returns so much when put upon the plate. 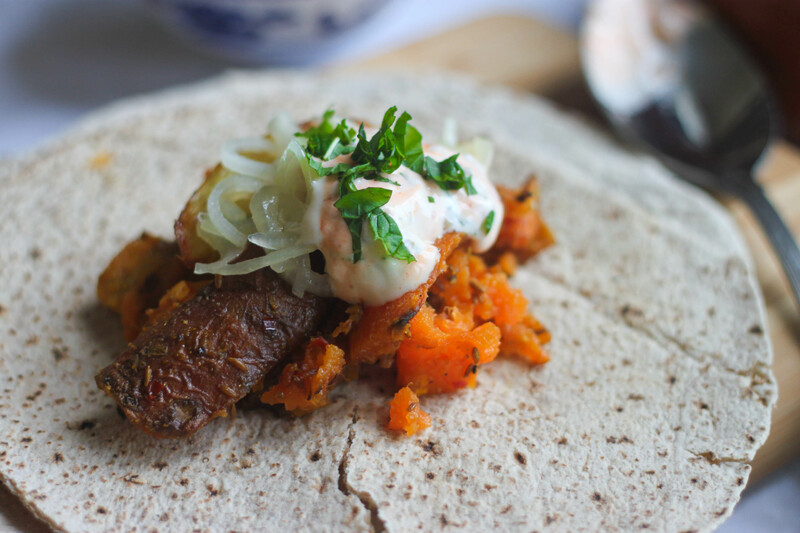 This recipe for Spiced Indian Potato Wraps was one of those recipes. I tweaked it a bit, and added Niall’s famous Harissa and Mint Yoghurt Sauce, and ba-da-bing ba-da-boom, I had a flipping gorgeous Wednesday night dinner. And it was totally vegetarian. Boy, did I feel smug. Like pretty much everybody else, the start of the week is always a little hectic in our house. On Mondays, we tend to eat light suppers after (more often than not) over-indulging on the weekend. When Tuesdays come around, we can sometimes still feel a little wiped. In need of comfort food, but craving something healthy. And so it was that a while back we came up with Pasta Tuesdays. Making a 15 minute dinner suits our energy levels and schedules, while the tasty things we pack into them usually push us gently back on to the road of feeling good again. Here’s a recipe I threw together one Tuesday which uses Rainbow Chard, possibly the prettiest vegetable of them all. 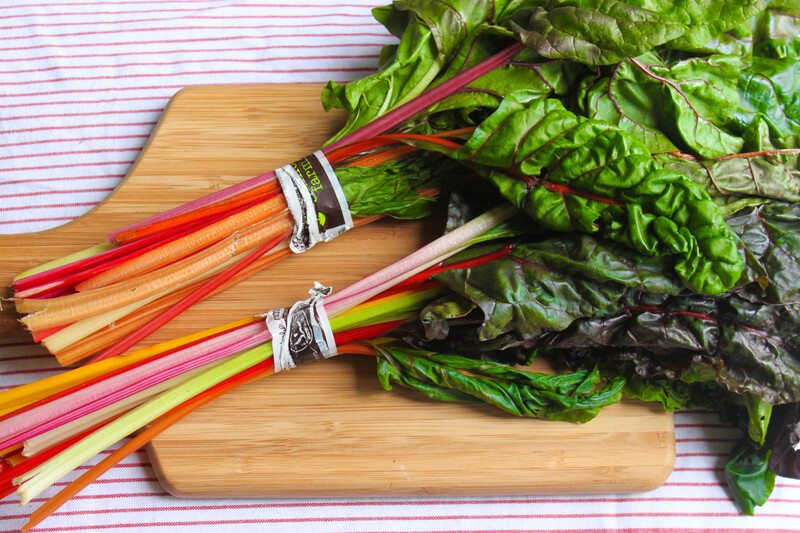 A taste-cousin of spinach, this variety of chard get its name from the beautiful colours splashed about its stalks. It’s available at the moment from Denis Healy’s stalls at The Temple Bar market and I’d imagine you’d get it in most farmers’ markets or good vegetable shops. If not, you could substitute it easily with using kale or some lovely big grown-up spinach. As opposed to the baby kind. There’s something about the combination of chili, garlic, lemon and chard here that makes this taste surprisingly good – hmmm, perhaps it’s the bacon? – so do try get your hands on the rainbow or the plain variety. Minimal effort and maximum results. My kind of mid-week supper.